Allandale Farm is a Brookline-based farm that connects Boston to its roots through sustainable growing practices. They were our first ever farm partner, and today we rescue more than 5,000 pounds of farm fresh food from them annually. We recently chatted with Farm Co-Manager Steph Moran about her role at the farm and why food rescue is important to farmers. Describe your role at Allandale Farm; what’s a typical day like? At Allandale Farm I act as one of two farm managers. The role of a farm manager can vary greatly between farms, but at Allandale, my co-manager Will and I act as complimentary pieces that fulfill a very large role. Together we manage everything from greenhouse seedings and daily harvests to planting, cultivating, and pest management schedules. We work hard to provide vegetables for our farmstand daily, as well as for our 250 member CSA and for over 60 local restaurants, stores, and distributors. Working alongside our crew, we work hard to grow vegetables that are delicious, but also sustainably grown and mindfully managed. On a given day I’ll wake up around 4:45 or 5:00 am to assess wholesale and farmstand orders, and either Will or I will construct our daily harvest list from those orders. At 7am we and our crew load up the trucks and start harvest, wash, and pack. We’ll then deliver produce to our partners in Boston, Somerville, and Cambridge. From there, we get to tackle the day’s field work which can range from hand weeding (carrots right now! ), mechanically cultivating, field prep, irrigating, seeding in the greenhouse or field, picking bulk crops, tying tomatoes, etc. In the Spring most of our time is devoted to caring for fields, planting seedlings, and weeding while in the dog days of August, much more of our time is spent picking tomatoes, organizing our cover crop schedule and weeding the farm. No two days are ever the same, which can be a great and daunting challenge. No day is typical, and yet there are familiar tasks and seasonal rhythms which help you find a sense of normalcy. What’s unique about Allandale Farm? Allandale is special for a great number of reasons — ranging from its location and heritage, to the diversity of its offerings — all of which are critical to its character. We feel humbled to steward the farm, knowing that it was carefully preserved for generations from the possibility of the city’s expansion and we’re reminded daily that we are both a farm in the city and a respite from the city’s bustle. Deer roam free (to our indignation), hawks and coyotes hunt, and rabbits, squirrels, turkeys, and geese live fairly freely, as if we weren’t in the city of Boston. Meanwhile, our farmstand and garden center remain busy all year long helping people with their farm staples (think tomatoes, pumpkins, Christmas trees, firewood, hayrides and even a huge offering of nursery plants grown right on the farm and through the help of other farms and nurseries). In short, Allandale is special because we get to offer our community a slew of experiences that wouldn’t normally exist within city limits. What do you love most about farming? What’s your favorite time of year on the farm? I love farming for many reasons, but primarily I love that I will always have room to learn in this profession. In farming, much of your education is reactive to whichever problem plagues you at any given moment. I love to learn about crop evolution and natural history, but you can spend an entire lifetime learning about plant biology, entomology, plant nutrient uptake, sustainable advancements in farming, welding, mechanics, business management, marketing, etc. Each year we try to make our education a priority in some way. My favorite vegetable to grow and eat is unequivocally potatoes. I think they’re satisfying to grow, they have beautiful foliage, and they come in SO many varieties. I’m also extremely fascinated by the history of the cultivation of potatoes and their role in world history. I could also happily eat potatoes for every single meal. In other words, they’re the full package. Allandale Farm was the first farm partner for Lovin’ Spoonfuls; how do you work with ‘Spoonfuls? We’re proud to have such a long standing relationship with Lovin’ Spoonfuls. 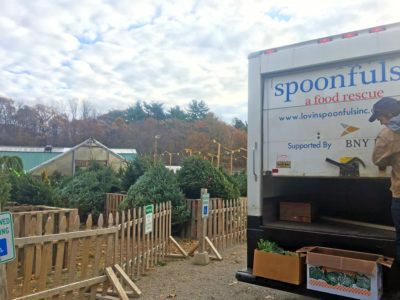 Like many farmers, I’m concerned about food waste and food access, and partnering with Lovin’ Spoonfuls allows me to know that every single moment of our collective effort to grow this food goes to good use. We like to believe that every crop we pick is destined to be a small and modest piece of someone’s life, and maybe in some ways can be the backdrop to their anniversary dinner, their birthday celebration, their summer cookout, or even the weeknight dinner that inspires someone’s kid to eat (insert vegetable here, we’ve heard it all) for the first time. Knowing that Lovin’ has expanded the possibility for all of our food is inspiring. Why is food rescue important to farmers? Food rescue should be a critical piece of any agricultural system. By nature of our business we pick and grow food all year round that never makes its way off the retail shelves. We love to support our community and the important mission of Lovin’ Spoonfuls AND we love that our CSA members and customers can trust that we’re careful with our food waste and output. We also work other great organizations like the Boston Area Gleaners to make sure that the produce that never makes it out of the field finds a good home.